Killer Content Marketing Creates Opportunity! - Go Creative Go! 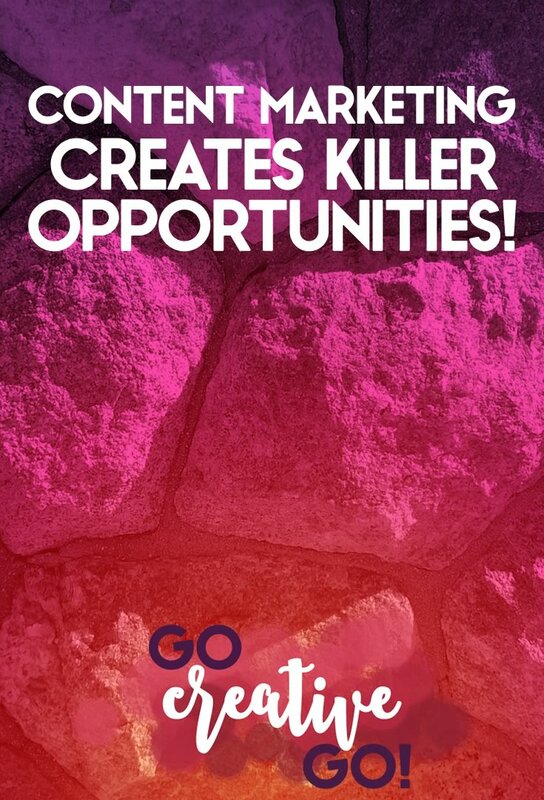 Killer Content Marketing Creates Opportunity! You hear it all the time, but especially at the launch of a new year … content marketing is where it’s at! Content marketing is do or die. Content is king. I could go on, but I think you get the point. I do, indeed! In fact, my focus and/or word of the year is CONTENT. But many of you, dear readers, are still waffling about blogging – or creating other types of content, like videos, images or even podcasts. You just can’t seem to make the time to create content on a regular basis. Why? Here’s hoping – fingers and heart crossed – that one, or more, of these five content creation benefits will sway you to add creating content to your busy schedule! 1. Unique Content Ups Visitors & Views! The creation of unique and targeted content, what you write, record or design – rather than what you share, gets visits to YOUR site. Your website! That website is the hub of your online empire. It’s where you direct traffic to all of the other digital goodness you’re creating, sharing, discussing, dissecting and more. Guess what? Visits to your site just might lead to someone take action (you know, via a Call to Action or other pretty button they are compelled to click), which just might land you a new connection, or even a prospect or solid lead! In the end we’re all in business to make money, in order to sustain our lifestyle. Prospects and leads are crucial to finalizing a sale and bringing in the paycheck! Killer content marketing drives the connection necessary to get prospect eyes on your product(s) and service(s) prize! You want people to sign-up to your lists, right? Of course. Your list, or email list if you’ve been hiding under a rock for the last few years, is something you own and it won’t go away unless you do something really stupid. But, in order to add new lovelies to that list, or those lists – many a savvy marketer segments, so has more than one list – you have to – YES – get them to your site. Content you’ve created is a big draw when it comes to creating clicks that land eyes on your site. When your content marketing efforts are of the killer sort, those who see it will undoubtedly want to see more. And when they want more, they like it delivered straight to their inbox. That means more list lovelies! 3. When It’s New (And Awesome), People Want To Share It! Social media shares generally don’t get as much reach and response as unique content, whether it be an image or a link to an article or video. Social media marketing and smart sharing is valuable to your overall marketing efforts. You don’t want to be the “it’s all about ME marketer,” after all. But, creating unique content for your social media platforms, content that drives prospects back to your site, your calls to action and your list building efforts is really the end goal. And it doesn’t have to take hours and hours! Twitter’s a great place for unique content sharing, even and especially with images, in 140 characters or less. Pretty please Twitter top brass, don’t raise the limit to 10K characters. SHUDDER! 4. Content Marketing Creates Conversation(s)! Taking a stand on an issue, sharing your unique perspective or taking on the devil’s advocate role can create conversation or discussion. Discussions and the further sharing of ideas can often spark interest in other things you have to say and share. 5. Content Marketing Inspires, Invokes & Influences! What’s influence? It’s that special something that comes when the content you share strikes a chord, is highly valuable, generates trust or drives a discussion. Sharing the content of others is great, and shows you’re generous and on top of your industry. But, creating content that inspires is one of the best ways to gain an influential position and credibility in your target market. With influence comes greater interaction and with more interaction you gain more interest in your service offerings. When you inspire someone to take action, you just might be the one hired to help implement that action! So ….. Are You Ready To Create Some Killer Content? Hopefully one of these five content creation benefits will strike with the AHA moment needed to make creating content one of your main marketing pursuits! How will you up the ante on your content marketing as 2016 continues? Smarter Marketing with Public Image Limited Automation Again? Scheduling Can Be Social!